Sci-fi horror can sometimes feel like an odd fit. The latter genre is more often rooted in the past than the future, better suited to organic fears than technological nightmares—hence the tendency to simply use the science fiction as window dressing for an old-fashioned monster movie. (There’s a reason Alien’s chills are rooted in messy flesh, and the malevolent A.I. drama of 2001 doesn’t play like horror.) Nightflyers, the new Syfy show based on a 1980 novella by Game Of Thrones author George R.R. Martin, attempts to locate the ghostly scares in the machine, and while it serves up cool imagery and compelling performances, the show is lacking in execution. It’s never boring, but it struggles to rise above the uneven handling of the material. The obvious point of comparison is the 1997 film Event Horizon, another story about a crew of spaceship-bound characters tormented by an unknown source of evil. (The less said about the prior attempt to adapt Martin’s novella, a limp 1987 film starring Catherine Mary Stuart, the better.) But this series goes further into the realm of fantasy by including a psychic among its cast of outer-space travelers. Having discovered an extraterrestrial vessel, scientist Dr. Karl D’Branin (The Night Shift’s Eoin Macken) assembles a team to hitch a ride on long-running spacecraft The Nightflyer, attempt to reach the thus-far unresponsive alien ship, and establish first contact, all in hopes of finding a means to save a rapidly dwindling human population on earth. Unfortunately, the Nightflyer’s crew is more fearful of the telepath capable of deadly mischief (Sam Strike) that D’Branin brings along as an alien communicator than they are optimistic about the new mission. Worse still, someone or something is causing dangerous hallucinations, sabotaging the ship, and putting the mission in jeopardy. There’s a lot going on, and the series races through its plot, often before it has a chance to really register. That’s probably for the best, though, because this thing can’t withstand much scrutiny. Hour-long sci-fi horror. Five episodes watched for review. This is an abrupt show. Plot developments are introduced pell-mell with little chance to build, leaving the viewer with a sense of whiplash as they attempt to process what happened in between scenes. At one point, it’s suggested that a month has passed onboard the ship, with nothing to mark the passing of time save for a character announcing as much. Some of this is a problem of editing—characters will suddenly appear in different places aboard the ship, which, when there’s a force creating ominous digital projections of people in the story, can easily cause confusion—but mostly it’s a problem of scripting, where diegetic mysteries being grappled with by the characters too easily shade into mysteries regarding the narrative of the series itself. It would be simple to get bogged down in the proliferation of confusingly rendered characters and plot points. There’s a telepath, but his powers are ambiguous at best, causing more confusion than intriguing mystery. The ship’s reclusive Captain Eris (David Ajala, making the best of an underwritten role) is forced to tread narrative water, pulling out the old “I can’t tell you that yet” tap-dance only to explain it all one episode later, with no logical reason for the delay. Too often, the show will introduce a question that could develop into something more (is this experience real? Is that threat a red herring?) only to brusquely toss it aside with an “Oh, guess not” a short while later. The upending of genre conventions Martin perfected with Game Of Thrones is either mishandled or underdeveloped here, as the normal tropes of space horror come across like standard-issue twists—some depicted with formulaic familiarity, others never blossoming into anything different enough to seem fresh. There’s a sense all of this has been done before, and showrunner Jeff Buhler doesn’t quite know how to make it feel new again. Eoin Macken, Gretchen Mol, and Angus Sampson in Nightflyers. Substituting a Syfy budget for the massive pay-cable one of its author’s more successful GoT sibling (and leaving Martin out of the creative process altogether; his HBO contract is exclusive), the series nonetheless manages to create an appealing visual style. Credit pilot director Mike Cahill (I Origins, Another Earth) with establishing a cool sense of spatial inventiveness: The camera will exit one window and soar along the outside of the massive ship, reveling in its scope, before entering another section of The Nightflyer to begin a new scene. And he has a good grasp of how to pull off standard-issue horror conventions; from an opening scene right out of a slasher flick to the ghostly projections that can appear at any time, he delivers some genuine scares that subsequent episodes manage to emulate with reasonable success. Similarly, the actors mostly sell all this supernatural-disguised-as-sci-fi hokum. So many of the characters are either inconsistent or forced into narrative situations that pivot them like ping-pong balls from one emotion to the next, it’s a relief when pros like Ajala or Angus Sampson just pick a mood and roll with it. 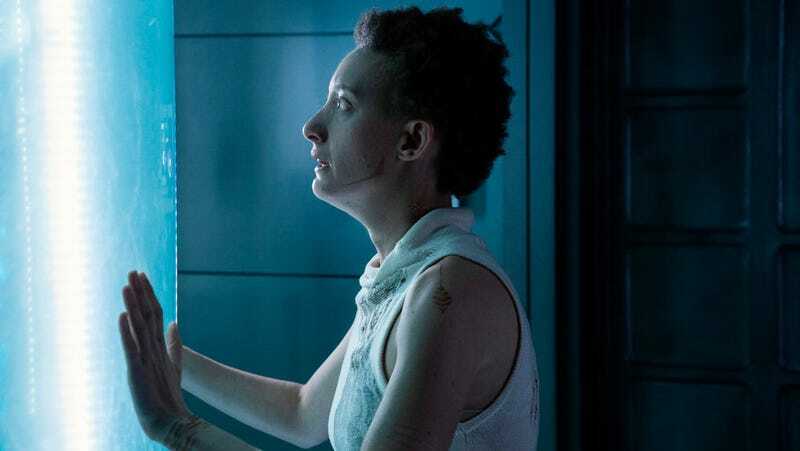 Maya Eshet, an actor with whom I was previously unfamiliar, is especially good; her computer specialist Lommie (with a port in her arm allowing her to literally connect with the ship’s controls) is the most complex and subtly shaded performance in the bunch. Eshet is deeply charismatic, a magnetic presence who elevates every scene in which she appears. It’s no coincidence that the fifth episode, which puts her front and center with a self-contained storyline about entering the computer mainframe, is the best one in the first half of the season. Ultimately, your tolerance for Nightflyers may depend on your fondness for the trappings of the genre. It’s engaging without being all that good, and while the whole thing unfolds with the implacable pace of a typical “let’s watch best intentions go horribly awry” horror movie (and at a rapid clip, thankfully), it lacks the depth of good human drama to anchor all the silliness. By the end, the silent and unknown alien entity in the distant reaches of space may feel more relatable than these implausible humans.